Geo A Payne and Son Ltd are an independent jewellers and pawnbrokers in Bournemouth, Dorset offering individual and unique products for sale. The original period feature shop frontage from the 1900’s still exists and services are offered as a local family run establishment to sell jewellery in Dorset. Bespoke jewellery can be made to your design using our 3D design software and advice from our jewellery professionals to create a unique piece just for you. Secondhand jewellery and silverware is stocked and can usually be sourced if a particular item is required. Geo A Payne has a lovely collection of vintage jewellery, pre-owned jewellery, precious old jewellery and some antique and period pieces. Visit this fine jewellers in Bournemouth to view their full collection or to speak to an expert about selling your jewellery or silverware. Geo A Payne and Son Ltd offer cash for gold and purchase scrap gold in Bournemouth with the best prices for gold in Dorset offered. If you are looking to sell gold in Bournemouth, sell rings in Dorset or to get a jewellery valuation visit their shop today. There are a large selection of engagement rings in this Bournemouth jewellers. Traditional, vintage and antique engagement rings, diamond engagement rings, modern platinum and bespoke engagement rings to offer you the utlimate unique engagement ring. Mens and ladies wedding rings in different styles including matching sets, diamond set wedding rings and bespoke wedding rings to beautifully compliment & fit around your engagement ring. 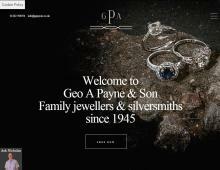 Geo A Payne and Son also carry out watch, silverware and jewellery repairs and detailed written jewellery valuations.